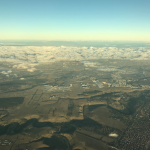 A day trip to Melbourne. 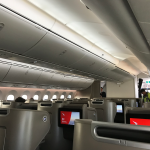 Qantas 787 Dreamliner Business Class. 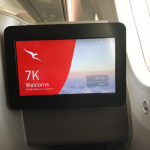 On Saturday, Qantas will launch non-stop flights between Perth and London, for the first time linking the UK and Australia with regularly scheduled non-stop flights. 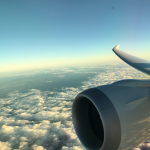 The aircraft that they’re using is the Boeing 787-9 Dreamliner. 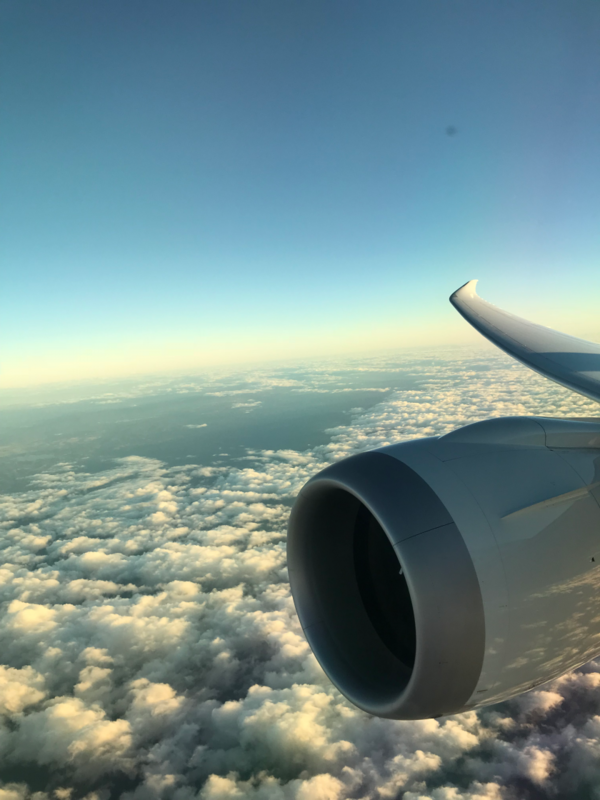 In order to help prepare both the flight and cabin crews, they’ve been using them to fly the route between Sydney and Melbourne so the crew are sufficiently practiced with the aircraft. 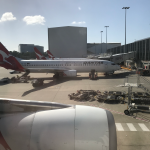 My day started in Sydney where I was getting the 10.00am service from Sydney over to Melbourne, in order to grab some lunch with a friend (who actually happens to work for Qantas). 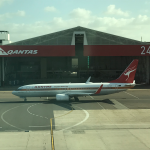 I grabbed an Uber from the Airbnb I was staying at, down to Kingsford Smith Airport and Terminal 3, the Qantas Domestic terminal. 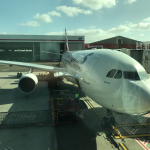 Security was very quick and there are no liquid restrictions for Australian domestic flights (although laptops still need to come out of bags). Within a few minutes I was in the lounge. 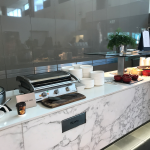 Qantas has two lounge concepts for its domestic network, the Qantas Club which is open to Qantas Gold and Platinum members, plus oneworld sapphire and emeralds, plus also those people purchasing Qantas Club membership. 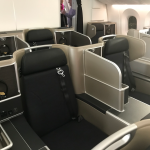 They also have the slightly better Business lounges which is open to those travelling business class, Qantas Platinums and oneworld emeralds only. 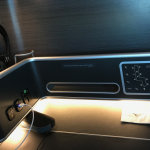 Being a oneworld emerald via British Airways, I wandered into the business lounge where there was only a cursory check of my boarding pass on my phone. 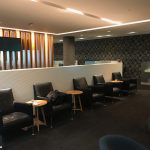 The lounge at Sydney is actually pretty good and a decent place to wait for the flight. 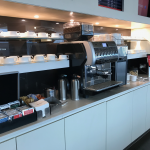 There’s a barista making decent coffee to order, plus a good selection of food for breakfast, including a few hot items such a scrambled eggs, sausages, bacon. 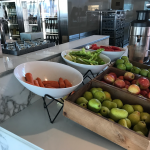 There’s also raw fruit and vegetables for making your own smoothies. 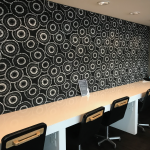 The lounge also had a great view over the apron and hangers and spotted one of their Boeing 737s in retro livery. 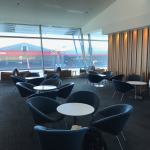 Flights between Sydney and Melbourne are every 15 minutes at peaks times so there was a pretty quick turnover of people in the lounge for the 45 minutes or so I waited. Unfortunately they do make flight announcements so almost every five minutes there was a loud PA announcing boarding to a destination. 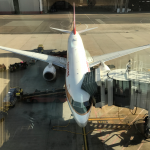 I wandered down to my gate a bit early to get a picture of the A330 that would be taking me to Melbourne. 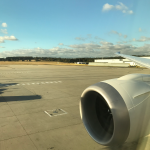 I had seat 25A, a window in the third row of the economy class cabin on the A330-200. 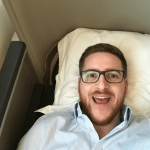 The seat next to me was occupied for the 1h 10m flight. The crew came through offering small snacks and drinks. I declined the snack (which was a Pride cookie) and just took some coffee and water. It wasn’t long before we were on the ground in Melbourne and I ended up having a rather lovely lunch in St. Kilda. 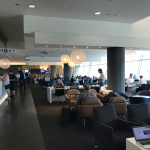 I returned to Melbourne Airport using the bus from Southern Cross station which at 17.00 took the best part of fifty minutes mostly stuck in traffic, before we arrived at the terminal building. 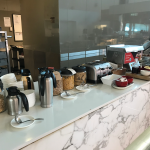 The priority queue at security wasn’t too bad and ten minutes later was in the very busy Business lounge. 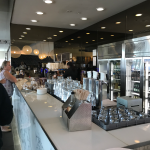 I didn’t take any pictures as it was very busy, however the concept was very similar to the Sydney lounges. 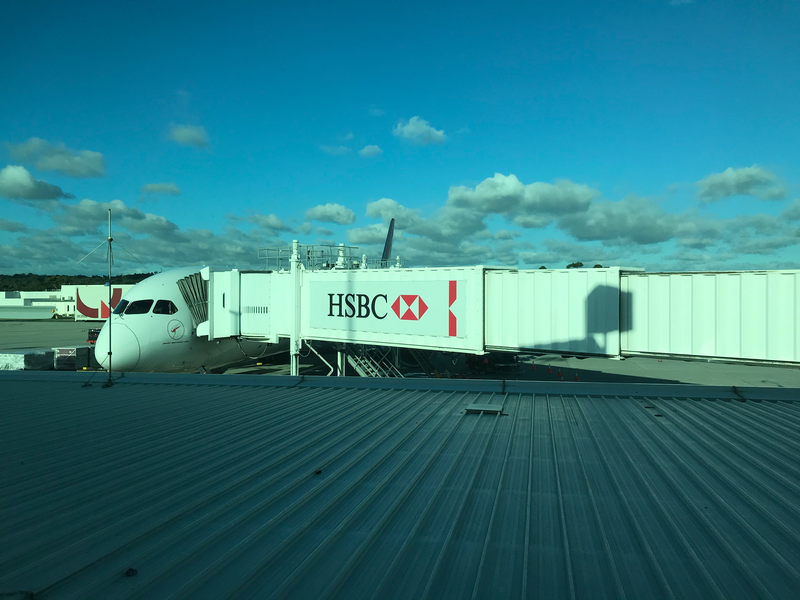 I headed down to the gate a few minutes before boarding, however due to the gate it was parked up at, wasn’t able to get the best of photos. I was second on board, was warmly greeted by the crew, and turned left to sit in 7K, the penultimate row of the front cabin. 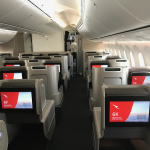 Qantas have opted for the Vantage XL product, which is a staggered 1-2-1 formation. 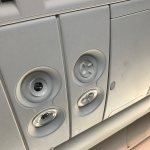 For the A and K seats, they alternate between being closer to the aisle, or closer to the window with one’s feat in a cubby hole forwards. The seat I was in, 7K was one of the seats closer to the window and further from the aisle. 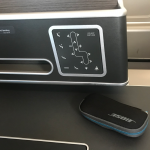 The middle two seats also have the same arrangement, with for example 6F being closer to the aisle, and 5F being slightly set back. On the ultra-longhauls, I’d probably prefer one set back, so do choose carefully. The seat had a shoulder strap that need to be harnessed for take-off and landing. 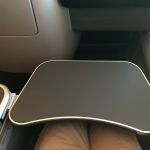 Talking of the seat, I thought it was very well designed with lots of places to store stuff. 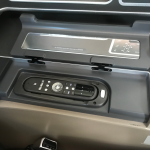 The seat controls were pretty logical and not overly complex like the Qantas A380 First Class seat. There were some nice touches like a light for the storage area, plus it was great to have an aircraft fitted with overhead vents. 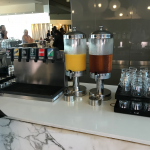 Especially on overnight flights where the cabin can get quite warm, it’s great to have these to cool yourself down. 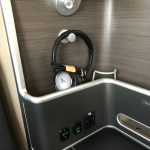 The headphones were also decent quality and the IFE controller pretty standard, although I used the touchscreen nearly exclusively. Boarding was completed on time, and we pushed back for the 1h 5m flight. This included a full hot meal for dinner. Whilst waiting for the meal to come around (as the crew started at the front of the cabin), I tried the seat out fully flat. 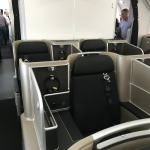 For the 17 hour long haul between London and Perth, I have no doubt it’ll be exceptionally comfortable. 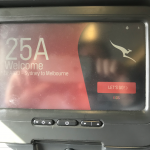 As usual with Qantas, the food was excellent – it was roasted lamb with vegetables. There was also a red velvet cake for dessert and fresh sourdough on the side. 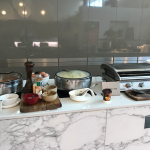 For an hour’s flight it was far superior to anything I’ve had served on the equivalent British Airways or Lufthansa flight, however Austrian certainly comes close with their catering. 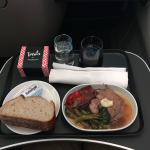 The meal service itself was a little slow, I think due to the crew trying to work out where everything was, coupled with them not normally doing flights as short as this. However there was more than enough time to eat, as well as have top-ups of the wine. 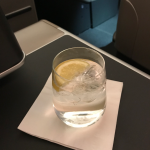 We did have to hold for a bit before arriving into Sydney, which meant that there was even time for a gin and tonic before landing as well. It’s an excellent product. 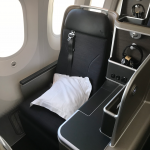 To be fair the seat is not up there with the likes of the Qatar Q-Suite, however with great Qantas crew I have no doubt that the overall experience will be outstanding. 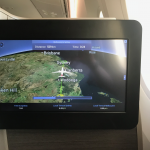 There’s clearly been a lot of thought put into every aspect of the journey and for those people needing to head down under, I have no doubt it’ll be one of the most comfortable ways to get there. Previous Post: Surry Hills and a wonderful Airbnb. Next Post: Bedraggled gingers in the Blue Mountains.